Learn to replace the features that you lost from Google Webmaster Tools! Webmaster Tools is a great place to keep track of your site indexing and any issues Google may have with your site. Over the past few years since its release, Google has added, deleted, and updated a number of features with Webmaster Tools. Not surprisingly, they’ve done it again. Let’s take a look at some of the updates recently made, and what you can do if they affect you. Google is eliminating quite a few features from Webmaster Tools. One such feature is the ability to create a robots.txt file for your website. This feature gave the option for site owners to have certain pages on their websites crawled or not crawled by Googlebot and is useful for making sure sites like thank you pages, image directories, or shopping cart pages that may not contain useful information, are not found in search engines. As a solution to this elimination, Google suggests to create a robots.txt document yourself or use one of the many free tools available on the internet. 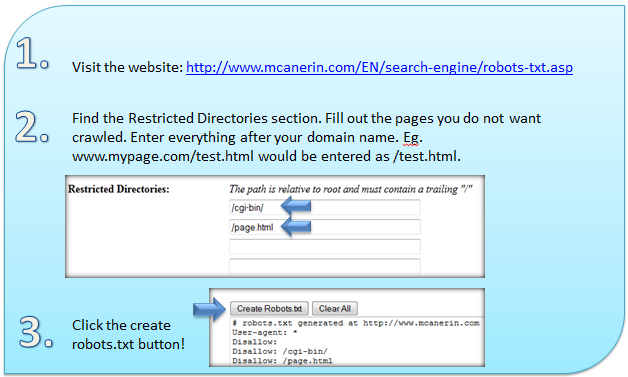 If you don’t want to create one yourself, consider a free generator like the one from Mcanerin International (http://www.mcanerin.com/EN/search-engine/robots-txt.asp). Remember, something written as /test/ would be considered an entire directory, which would block any pages within it. Written as /test.html would be the singular page. If you would only like certain search engines to not crawl your site, you can select these from other pull downs on the screen. Once you fill in the correct information into the generator, copy and paste the code into a text editor, such as notepad, and save it as robots.txt. Make sure robots is plural, and that the document type is a .txt file. Upload this document to your root directory on your web page. To update your robots.txt file, you can simply delete unwanted rows, or copy and paste them, editing only the URL you want to block. To view the blocked URL’s of your website and to make sure your robots.txt file is working properly, log in to Webmaster Tools. Under Health, select Blocked URL’s. It is important to know that a robots.txt file will not block these specific pages from showing up in search results if they are linked to a page that is crawled. In addition, a robots.txt file is not a good solution to making sure private and personal directories will not be able to be viewed by everyone. Page load time is just one factor Google considers in SEO. Not only should you have a low load speed for SEO, but for overall visitor satisfaction as well. Visitors who have to wait long load times to view product pages are more likely to leave without buying anything. Recently, Google has eliminated the experimental Site Performance feature that was part of their Webmaster Tools Labs. This feature measured the average load time of your website and gave suggestions on how to fix certain issues. Due to low usage, Google has eliminated this feature and suggests using yet another free tool found on the web. 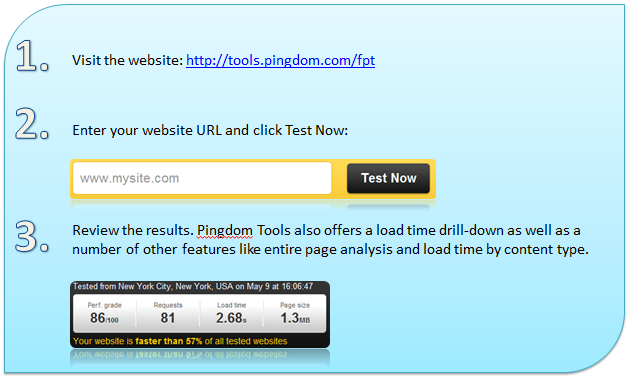 One popular free online tool can be found at Pingdom Tools (http://tools.pingdom.com/fpt). Simply enter your website and go. Google also recommends using the Site Speed feature in Google Analytics or PageSpeed Online (https://developers.google.com/pagespeed/). Using Pingdom Tools offers you site grades and a number of other useful features and suggestions that can help you reduce the overall load time of your website and in turn increase SEO and visitor satisfaction. Google is also removing the Subscriber Stats feature from Webmaster Tools. This feature reported the stats for a website’s RSS or Atom feeds. 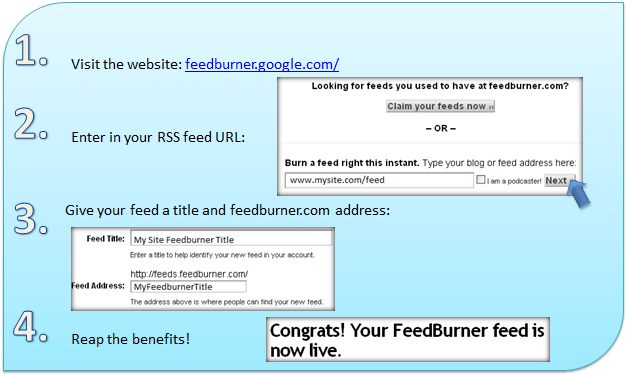 Feeds are a great way to allow visitors to subscribe to regular updates via web portal, news reader, or even email. As a replacement, Google suggests using one of their own similar products, Feedburner (feedburner.google.com). This program is 100% free and backed by Google. It allows you to keep track of your RSS feed subscribers, change your feed URL without losing subscribers, and is browser friendly. Customize it with your company logo at the top of the screen, select a color template to match your company look, and even offer email subscriptions to your fans. The elimination of these features don’t mean you need to sacrifice your data. Simply find an alternative program, such as one of the tools listed above, and you’ll be on your way to collecting and using data just as you were before.